In a future controlled by Super Massive Computers (SMC’s), mankind is on the brink of collapse. Only a small number of renegade hackers have the skills and the agency to fight back, but with a series of increasingly more powerful computers to face off against, their hopes of success are slim. Renegade is a cooperative game that scales based on player count and supports from one to five players with very minimal variation to the basic rules. The game is played on a modular board that comprises of five individual tiles (known as servers) that can be placed more or less however the players want, albeit with the consideration that certain board layouts can give either advantages or disadvantages against particular SMC’s. The objective of the game is to defeat the SMC by surviving the effects of a number of countermeasure cards that will be chosen at random from a deck of bronze, silver and gold cards, depending on the SMC you’ve chosen to face off against. Each countermeasure card has a way of interacting with the servers, the players or some of the in game artifacts in a way that is negative for the players. The countermeasure cards combine with whatever passive effects the SMC itself has and some combinations of SMC and countermeasure can be particularly deadly. Each player has one (or in one case, two) avatars, each of which will have their own home server. 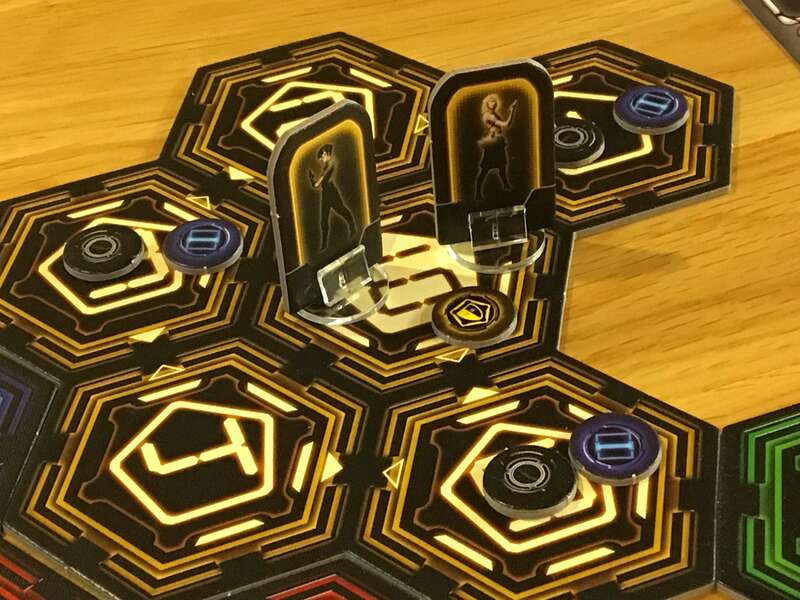 These avatars move around the board adding, moving or removing tokens that represent either the defenses of the SMC (sparks or guardians) or the four friendly elements that allow the players to influence the outcome of the game (contaminants) such as data nodes. There’s an awful lot of fairly specific language in Renegade which I will spare you from as best I can, but I will talk more about that later. In order to interact with the servers and place contaminants, the players will need to use a deck of cards (which is different for each of the available avatars.) The basic cards can be upgraded on one for one basis with four face up cards dealt from the Hack Shack, although this will require the symbols shown on other cards to be spent in order to pay the cost of the new cards. 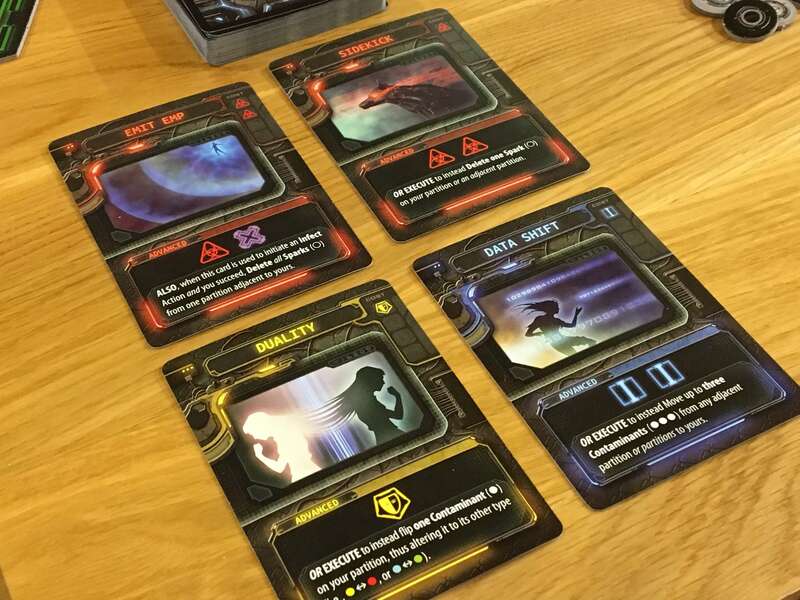 Each player decks begin with fifteen cards and that number never changes as cards are swapped in and our, so the deck building aspect in Renegade is focused on specialisation in some cases, or increased consistency and overall power level in others. Ultimately, if the players survive the SMC’s countermeasures and manage to defeat it, then everyone wins. Renegade is a truly cooperative game that doesn’t use measures like victory or prestige points to indicate the amount of contribution that one player has made compared to another. Likewise, if the SMC’s countermeasures overrun the network of servers, then all players will lose. Without anticipating what I might say in the conclusion too early, it’s fair to say that Renegade is unusually accommodating for both solo and multiplayer gaming and there are no inherent weaknesses in either way of playing. Like all Victory Point Games products, Renegade offers a very high standard of component quality, whilst having still been manufactured to meet a sensible price point. Given the complexity of some of the language used to describe individual components within the game (different contaminants etc) I would also say that debutante designer Richard Wilkins has also done a great job of minimising component clutter, which makes Renegade easier to setup than you might imagine. Each of the individual servers that make up the board are built from quality card stock featuring bright colours and bold artwork that gives the game an eye catching and unusual board presence. The cards that proliferate the player decks, SMC (and countermeasure) setup and the Hack Shack are all clear, well cut and finished with appropriate (if sometimes a little generic) artwork. I like the fact that there are ten avatars to choose from, but the avatar cards (which also act as player aids) are a little overwhelming to begin with. Finally, the remaining components are predominantly made up of different tokens that represent sparks, guardians, contaminants and so on. Most of these are small and some of them (the sparks especially) can be a little bit fiddly, especially given that they are a little hard to see against the board pieces. This is a very minor complaint and I think the decision to make the pieces small was a conscious one because of how many might be placed on a particular space. Just be mindful that if you struggle with tiny pieces, then you might need to use tongs or similar. Turns in Renegade are quicker and more straightforward than you might think, although that’s not for lack of a deep and occasionally obtuse instruction manual that took me a couple of reads to fully come to terms with. I always use manuals to learn games because I see it as something that I need to do, but I would recommend for this game that you actually refer to some of the videos created by the designer, as they will get you there much faster. Whilst most of these are fairly brief and self-explanatory, I’ll cover the Command Actions Step and the placement of new sparks in a little more detail, since they are by far the most involved. For Command Actions, the active player will place cards from their hand in their personal discard pile to generate command points of five different colours. Each of these colours represents a different aspect of hacking the SMC, such as leadership, cognition or destruction. Command points of various colours (as you’ve likely guessed) allow the players to take various Command Actions, hence the name of this step. Information (blue) allows movement, with each space moved costing one blue command point, unless travelling via data nodes which create a kind of “Information Highway” as the game puts it. Cognition (green) allows players to push objects around the game world, including enemy sparks. Uploading requires three command points of the same kind to be spent, but it allows the player to add a “Contaminant” to the board, which will come with a benefit depending upon its type. Contaminants can later be upgraded to Installations, or they can be used to do things like deleting Sparks, but ultimately, you’ll focus in on the ones that benefit you based on the current board state and the Countermeasure objectives that you are aiming to achieve. I’ve mentioned Sparks a couple of times now, so I should briefly mention the placement of them. Every turn, the SMC will send Sparks to attempt to swamp the players and ultimately, cause them to lose. The number of Sparks included in the game is finite, so any Sparks required over and above that will result in a game loss. Similarly, if three Sparks occupy the same space, then much like Contaminants becoming Installations, they transform into Guardians – and that’s bad. 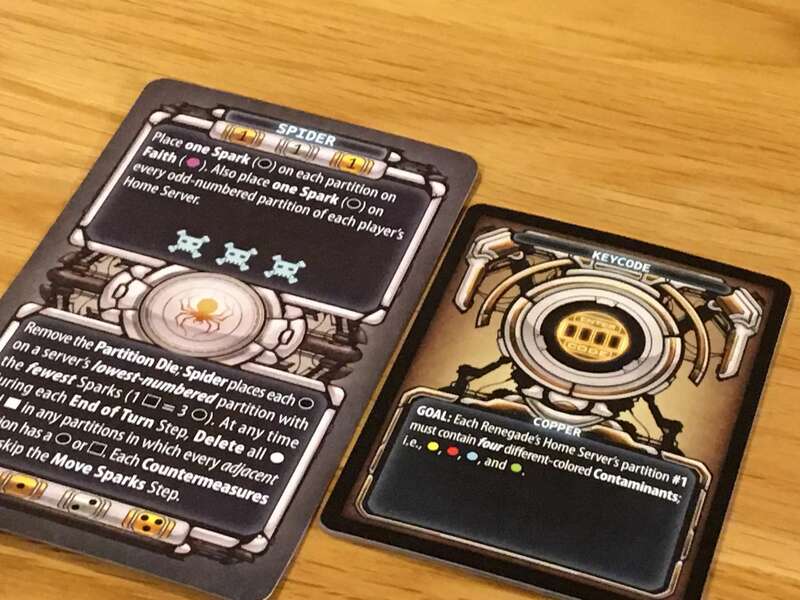 Sparks placement is often random (based on a custom die roll) but it is also prescribed by a number of the countermeasure cards in the game, so understanding how Sparks will be placed over the course of several turns is key to ensuring victory. Another thing that players can do is spend their command points to then upgrade their starting cards with better ones from The Hack Shack. If a player can afford the cost (in command points) shown on a card that is currently face up on the table, then they may buy it, which requires them to swap it for another card from their starting deck. As a result, players begin with fifteen cards and end with fifteen cards, albeit much more powerful ones. After the placement of Sparks and the Command Actions Phase players draw cards up to their hand limit (normally five, but it is possible to carry a card from one round to the next, to provide six) and then perform the end of turn cleanup step. It’s worth noting that I have massively simplified (and outright ignored) a lot of the possibilities for command actions, so it’s well worth checking out the videos that I mentioned earlier if you’d like to see how the game works in practice. Now, whilst Renegade is initially very daunting because it uses a lot of “in game” language and because it is inherently fairly complex and filled with decisions and options, it’s also quite rewarding and highly variable. Like many of the best sandbox style games, it comes with a highly variable board, a lot of card and player character variation and a number of different missions and variants. 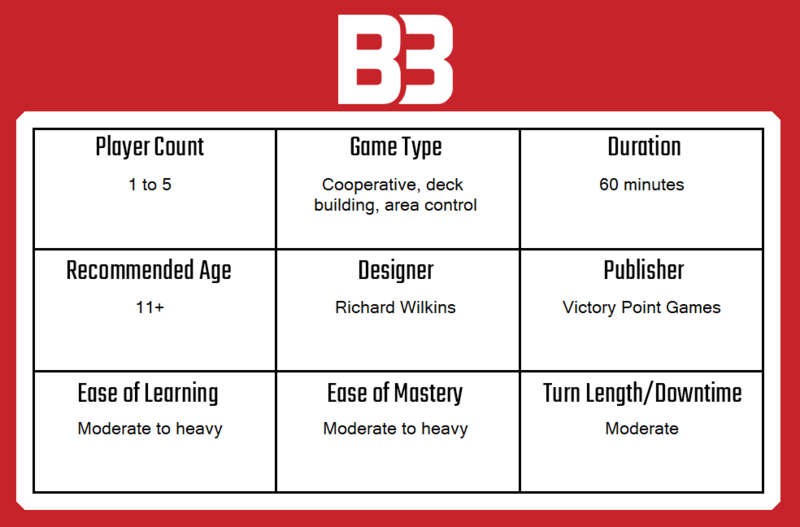 Each possible combination feels relatively unique in terms of how it challenges the player, which make the high levels of replay value very attractive to both solo and cooperative gamers alike. The game is highly unusual in looks, although as I mentioned earlier, some of the pieces are fiddly. This has the benefit of drawing players in from across the room, which is something that doesn’t happen often at my gaming group, due to the high number of games on offer across the tables. I’d say that learning Renegade, despite its complexity, is quite a pleasures thanks to how well it copes with solo players and because it includes a “learning” SMC opponent that is designed specifically for players to experience their first game against. Renegade caters well for gamers of all skill levels, with a range of SMC’s to face off against (including the ridiculously hard Mother) and a number of variants that can make the game easier or harder within the structure of the core experience. Again, this all ties back to replay value, which I do think is very high in Renegade. On the ever so slight downside, the game is cooperative and winning or losing is shared among the players, but I don’t feel like there is a lot of interaction between the players except to verbally agree the best course of action. You can’t have it all though, I suppose! Ultimately I think Renegade is a game that will appeal to solo or cooperative focused players above all others, in particular those looking for a challenging and/or mid to heavy weight experience. It’s a very well designed game that features lots of variation but very little outright luck, because almost every bit of information is available to you and any randomness (Spark spawning, for example) still has predictable elements to it. Renegade does have a complex manual and it does require an amount of investment to get into, but I think that’s the trade off for once you do get over the hump and begin to experience what the game has to offer. 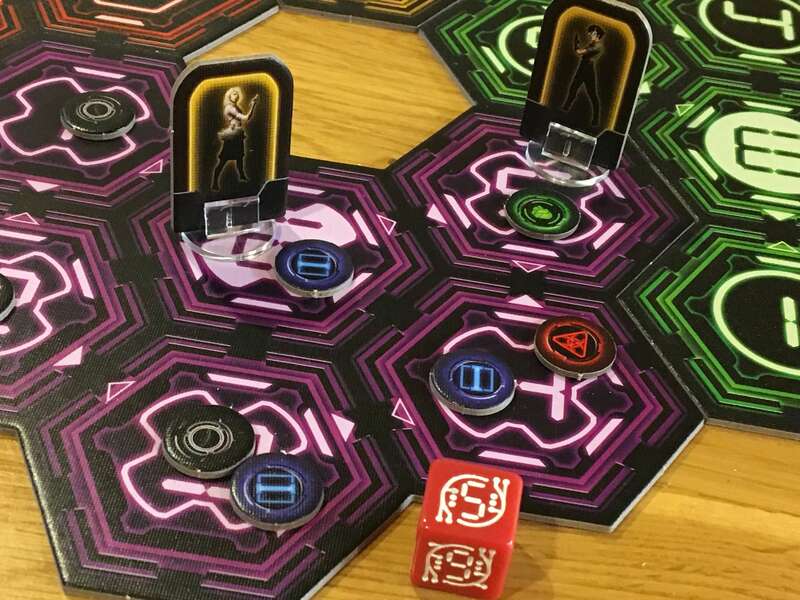 If you want a light or party game, then Renegade might not be for you, but then again if you are simply considering looking for a solo game or something completely different, then there’s a very immersive theme here wrapped around a meticulous and challenging design. A copy of Renegade was provided for review purposes. 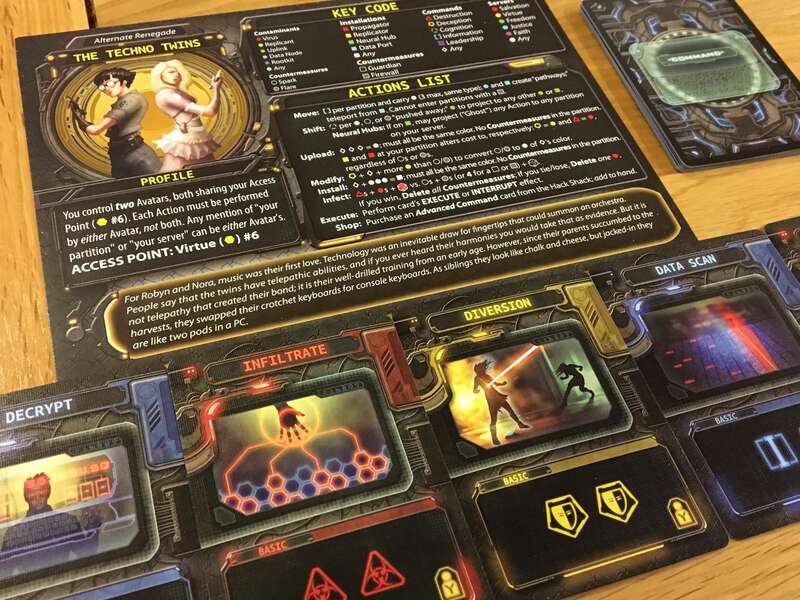 You can find out more about Renegade on the website of publisher Victory Point Games.